Diagonal cutting edges, precision matched to optimum angle ensure long life for cutting hard and soft wires. Cutting edges are sharp and precision machined to appropriate angle to cut thick and thin wires neatly with ease. Insulated with thick CA sleeve. Taparia 165mm Side Cutting Plier in Printed Bag Packing, 1121-6N (Pack of 10) is a premium quality Other Pliers from Taparia. Moglix is a well-known ecommerce platform for qualitative range of Other Pliers. All Taparia 165mm Side Cutting Plier in Printed Bag Packing, 1121-6N (Pack of 10) are manufactured by using quality assured material and advanced techniques, which make them up to the standard in this highly challenging field. The materials utilized to manufacture Taparia 165mm Side Cutting Plier in Printed Bag Packing, 1121-6N (Pack of 10), are sourced from the most reliable and official Other Pliers vendors, chosen after performing detailed market surveys. Thus, Taparia products are widely acknowledged in the market for their high quality. 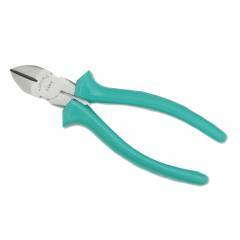 We are dedicatedly involved in providing an excellent quality array of Taparia Other Pliers.